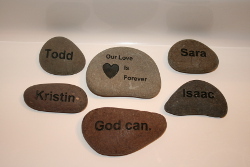 Back at home in Wisconsin, I set the rock on the window sill above my kitchen sink and read the words on it often. We were praying for Todd’s healing, praying for our house to sell, praying for peace and joy. Over a year later our house finally sold and I packed the rocks amongst other miscellaneous items. We moved to my hometown, built a handicap-accessible home across field from my parents, and settled into life in Upper Michigan. The curriculum pointed out that just as Jesus met the blind man’s need for healing, He will meet our needs. So where’s the healing for Todd? Wait a minute. Paul was in need? Paul was telling the Philippians that God will meet their needs even as he was in prison, at times hungry and in want. God promises us strength. Maybe we get healed. Maybe we don’t. But He is with us, giving us strength. We continue to pray for Todd’s healing yet the ALS slowly and relentlessly progresses. At the same time we see God’s hand in the timing of our house sale, in the building of our house with people volunteering to help with various projects at just the right time, and now we are in a place where we have the support of nearby family and are building new friendships. Paul saw God using him to share the message of salvation through faith in Christ. And I am finding joy in passing on the things I am learning from God’s word to the Sunday School kids, helping prepare them to face adversity, teaching them that although life doesn’t always go the way we would choose, even in the midst of prison or pain, we can praise the God who is with us, giving us strength. So what was the point of all those healings and miracles that Jesus did? To show us that Jesus is God’s son, the promised Savior. Jesus fulfilled prophecy when he healed people, he showed love and compassion to the sick and disabled he came in contact with, but He didn’t go around seeking out people to heal. In fact, in Mark 8 He told the blind man not to go into the village. He didn’t want the emphasis of His ministry to be His miracles when He had something much bigger on His mind. Jesus came to give us spiritual healing through faith in Him. After Jesus healed the blind man He asked Peter, “Who do you say I am?” Peter told Him, “You are the Christ.” Jesus told the disciples not to tell anyone and then began to teach them about what was coming: His death and resurrection, the reason He came to this earth. He tells the crowd, “If anyone would come after me, he must deny himself, take up his cross and follow me.” Our Lord suffered and died on a cross for us. Here on earth, we too suffer, and we follow Him. This entry was posted in Suffering on August 15, 2013 by kdneva. Such honest, moving and uplifting blog entries, both of you! Wishing you well on your publication journey and more importantly on all the important passages, revelations and challenges that your family is facing with faith, practicality, humor, energy and love!